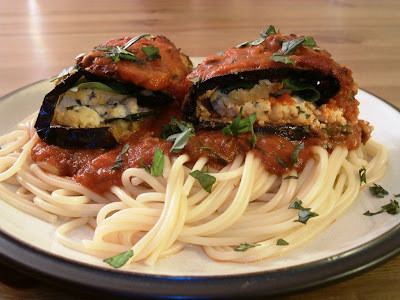 Eggplant Rollatini with Tofu Basil 'Ricotta', Toasted Pine Nuts, Spinach and Olive Marinara Sauce over spaghetti. In the pan post fried and rolled but before baked, some of these are breaded with panko and some with paxo breadcrumbs - I couldn't decide which to use but felt the paxo being finer worked better with these. So yes! It was our 1 year veganniversary on vriday (sorry, couldn't resist!) and I decided to make a big deal out of it and prepare an entire meal straight out of 'Veganomicon' (which has yet to fail me - amazing cookbook - buy it!). Normally I would make small changes here and there but this time I followed everything to a T and made everything by scratch (well, bar the spaghetti!). 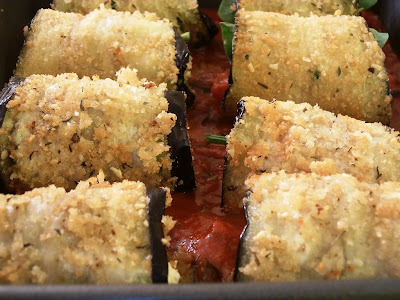 The eggplant rollatini is thinly sliced eggplant, breaded and fried in olive oil then rolled up with spinach, toasted pine nuts and their tofu basil ricotta - which is amazing! The breading mixture is also flavoured with their 'almesan' - a very tasty parmesan type recipe. They recommended the marinara sauce in the cookbook but specifically the olive variation one which has chopped black olives added to the sauce. As for what to serve it with they recommended just some steamed broccoli to keep it light or some spaghetti with more sauce for a bigger meal - clearly, we did the latter! It was amazing! 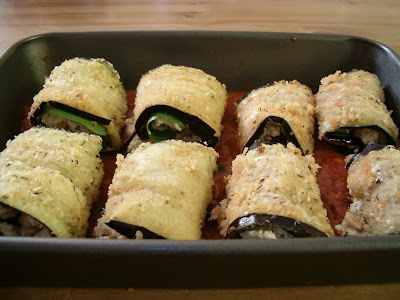 We have been very anti-eggplant in the past having had it only a couple times in restaurants clearly poorly prepared. As a result I have never actually bought any myself, or cooked with it. It was a wedding we went to in the summer where our vegan meals contained eggplant rolls, cooked properly, that we realized what we were missing out on. So glad I tried this as it's great for fancy dinners and I can now safely say I love eggplant! Out of the whole recipe, the only thing I would change next time is to add a tiny bit of sugar in the sauce just to take the acidic edge off as it was quite sharp. Otherwise, everything was perfect. 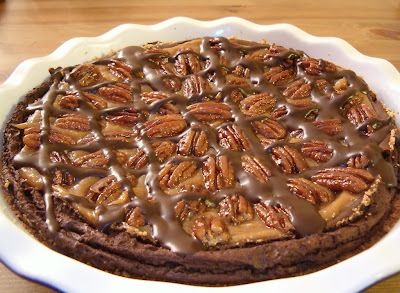 The caramel is particularly good, as are those maple candied pecans! 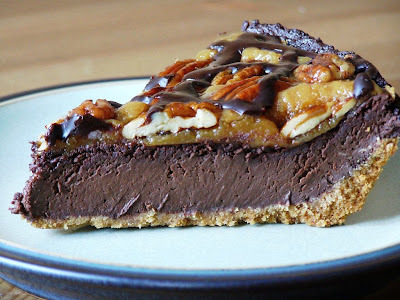 I will definitely be making those again just to snack on, I wasn't sure there was going to be any left for the pie as I couldn't stop eating them.... so good! No recipe for the main as it's from a cookbook, but Isa herself has posted the recipe for the lovely pie on her blog HERE !